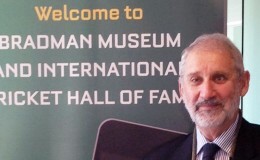 The Bradman Museum’s World of Cricket | The International Cricket Hall of Fame. During the 2014-15 season Australia stages the eleventh ICC World Cup of Cricket, with fourteen nations competing in 49 fifty-over matches. At the same time the Bradman Museum, a monument to the greatest cricketer of all time, celebrates its 25th anniversary. To mark that milestone at a time when the eyes of the cricketing world will be on Australia, this book reveals for the first time in print the founding treasure of the Bradman Museum: the Don’s personal collection of 35-mm slides. 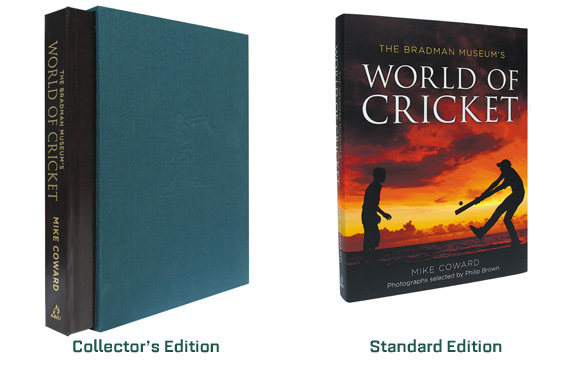 With Bradman’s typed commentary and handwritten amendments alongside, the slides showcase the history of cricket, from its agrarian beginnings in England to its status as a game of Empire, fit for introduction to the colonies. Grace, Hobbs, Hendren, Larwood, O’Reilly, McCabe, Lindwall, Trueman – on these legends and many more Bradman gives us his opinion with characteristic directness. We gain insight into the game as he saw it in all its magic. While Bradman’s personal slide collection forms the centrepiece of this stunning collection, the work of three of cricket’s greatest photographers are also featured. Among Bruce Postle’s black and white photos from the 1960s and 70s are iconic shots that will thrill any cricket lover. Vivian Jenkins’ work brings to life the drama of the 1970s and World Series Cricket, while Philip Brown’s camera ranges across international cricket up to the present day. This treasure trove of cricket is woven seamlessly together by the matchless commentary of Mike Coward, one of Australia’s most acclaimed experts. or call Paul on 02 4862 1247. Once you have downloaded the FREE APP for your phone, open the APP and click on the yellow button that says “VIDEOS”. Have a look at our video below.